In the United States, drinking is highly prevalent among adults and 71% have had alcohol at least once in the past year. This widespread use is accompanied by frequent abuse: 7.2% of adults have an alcohol-related disorder, such as alcoholism. As vast numbers of Americans struggle with their alcohol use, they face times of desperation and times of success. Hard-partying holidays, such as the Fourth of July, can put pressure on those trying to give up drinking, while the New Year can present an opportunity to commit to a new beginning. To shore up their willpower, most will seek well-known support groups, such as Alcoholics Anonymous (AA). Still, others may seek a different kind of support group. 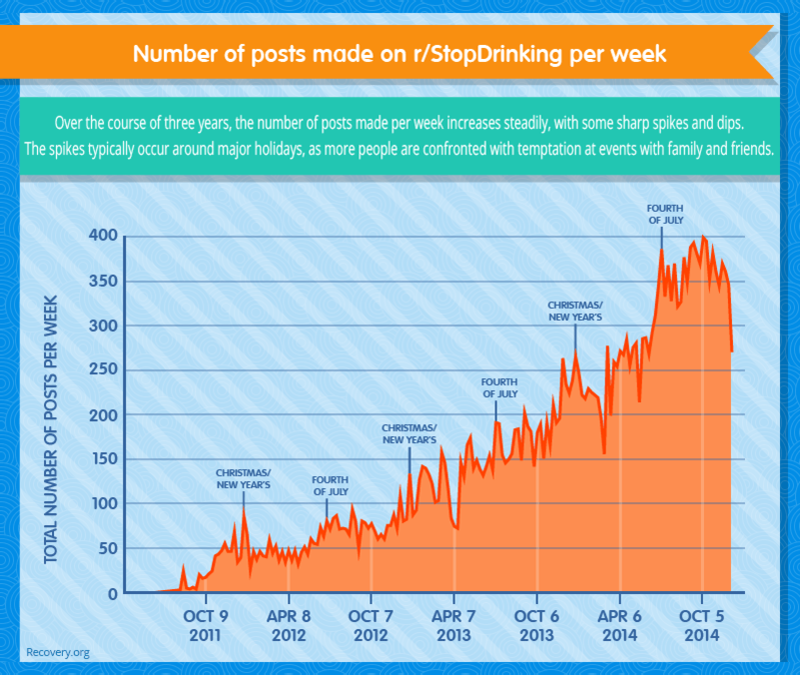 Meet r/StopDrinking: an online support group, through the popular website reddit, which focuses on user-created and user-run communities. These communities, or subreddits, share text or links with users who have common interests. On r/StopDrinking, users can share their stories of success or failure with a like-minded audience – one that shares their desire to overcome alcoholism. 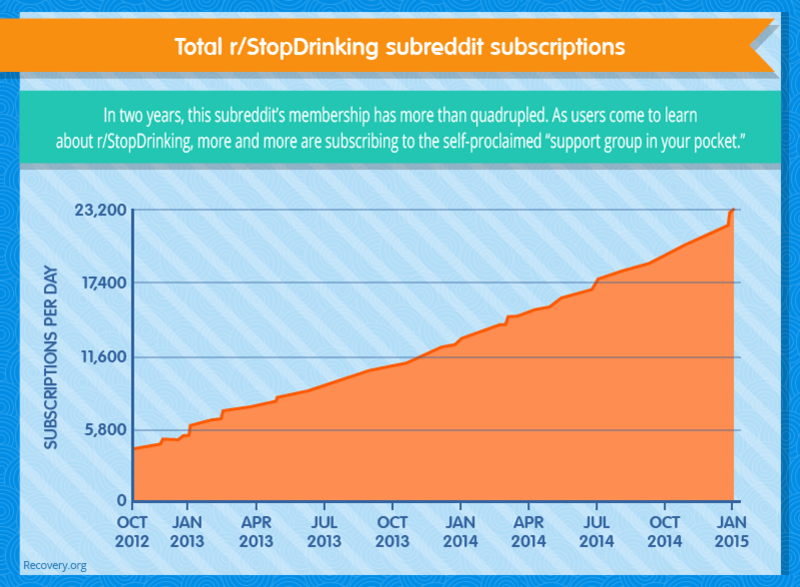 The r/StopDrinking community is made up of approximately 23,000 users, nearly four times the amount of subscribers this subreddit had this time two years ago. We ran an analysis of the top posts and when they were posted. Because the front page of a subreddit is populated by recent popular posts, it could be helpful to know when users should post to receive maximum views and support from others. If you’re looking to get the most support for a problem, keep in mind: The peak posting time would be Thursday around noon. This subreddit has a number of features designed to help alcoholics in recovery. One of the community’s most notable features is its badges. Though other subreddits have badges (e.g., r/NFL has badges that show your favorite team’s logo), this subreddit’s badges serve a purpose similar to that of AA chips. User badges count the days since a member’s last drink. For emergency situations, the board has a special Internet Relay Chat (IRC) feature that allows users to receive a more active peer-to-peer experience. In one instance, one user urged another, who posted she was contemplating suicide, to get on an IRC to ensure the user could receive more immediate help. That said, the subreddit’s subscribers are wisely told not to give medical advice; the guidelines encourage users to seek medical advice from qualified, non-anonymous professionals instead. If a redditor is unsure whether or not he or she needs help dealing with alcohol, a survey (posted in the group’s sidebar) is available to help him or her identify a drinking problem. 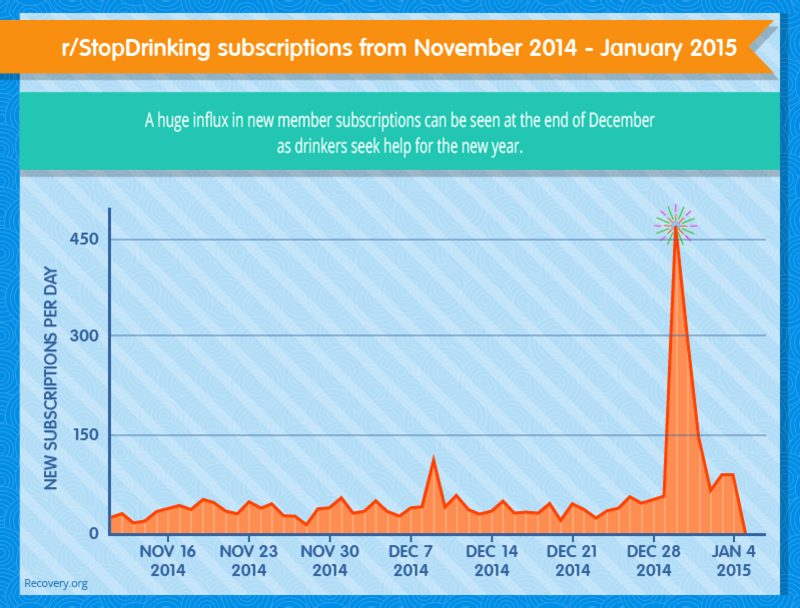 When looking at the traffic and subscriber trends from November 2014 to January 2015, the month of December is king for new subscribers – and it’s no secret why. December hosts the granddaddy of all American holidays: Christmas. It also happens to be the lead-up month to the New Year, a time when a great number of alcoholics will resolve to kick their habit to the curb. Consistently, there’s a big gap in the number of views between total page-views and unique users as well. Most traffic is coming from repeat visitors checking back in with the community. But it leads us to another question. How does this subreddit treat other holidays? Are people as gung-ho about kicking their habit on other holidays? We took a look at some of the top drinking holidays, according to a recently released study by BACtrack. Holidays, no matter which, are trying times for those who struggle with alcoholism every day. As friends and family turn to the bottle for recreation, these guys and gals are forced into tough situations, which can make for some busy times on this subreddit. As you can see, when the new year rolls around, a large spike in new subscribers appears; however, there are also spikes in posting activity around other holidays. Let’s take a closer look. The month of February can be a tough one for temptation, as the Super Bowl and Valentine’s Day fall within a week or two of each other. The Super Bowl isn’t much of a problem for posters, who have a mostly positive outlook heading into the annual event and a positive outlook coming out clean on the other end. Valentine’s Day is a little tougher for people who sometimes turn to drinks to help them cope with failing relationships. A holiday that celebrates romance can be a cruel reminder to some of what they no longer have, and many posts allude to those tough times. What’s interesting is here we see a spike of posts occurring the day before Valentine’s Day, possibly because people are anxious the holiday might cause them to relapse. Cinco de Mayo, the Mexican Independence Day, is another holiday worth considering. Looking at posts around this time, users seemed to be fine with not drinking on Cinco de Mayo. Considering the tradition of celebrating Cinco de Mayo in the U.S. seems to be exclusively for drinking and less for gathering with friends, this seems like a fairly easy holiday to dodge. Indeed, many people reported making it through this holiday with ease. One of the most curious things, however, is when the Cinco de Mayo spike occurs. The spike on May 8 registers nearly twice the number of posts as May 5 does. Weekends such as Mother’s Day and Father’s Day present a challenge for the community. These holidays sparked conversations about family issues that lead to alcohol abuse, parents’ struggles with alcoholism, and issues dealing with recently deceased parents. This pair of holidays that celebrate family relationships had a noticeable increase in number of posts declaring relapses. Fourth of July weekend is a rough one for r/StopDrinking. There are a fairly constant number of posts around the time of the holiday, with a slight dip in activity on July 4 itself. Though there were next to no reports of relapses, there were many users posting about how difficult it is not to cave in and drink. Where many other holidays have posts in which people report success, those on America’s birthday feature fewer “smiles” and more “clenched teeth” as people try to survive the weekend with their sobriety intact. Halloween, though a time where we celebrate the macabre, is actually one of the most upbeat holidays on r/StopDrinking. Almost all of the posts our Halloween search turned up were those from people reporting success in staying sober. Halloween is also statistically different from the other holidays. Instead of having a dip in activity from the previous day, October 30, activity on the subreddit increased on the holiday itself. Still, November 1 is a bigger day for posting. Thanksgiving is a mixed bag. 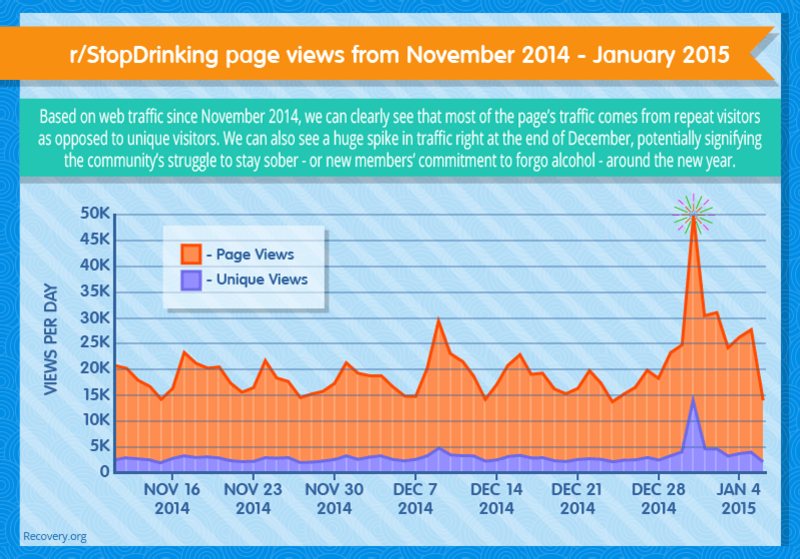 The majority of posts are from people announcing their intent or success in staying sober through Thanksgiving. Many users discussed positive feelings about their sobriety. A few posters discussed trouble staying strong, and a few admitted to relapses. But perhaps the post that was the most indicative of this community’s spirit was one in which a redditor in southern Illinois invited other users in the area – relative strangers – over for a sober Thanksgiving dinner. Christmas is supposed to be a time of cheer. But with all the parties, it can be more like a recovering alcoholic’s end-of-the-year boss fight. As such, we see a huge spike in posts on Christmas Eve, as users prepare for the holiday; a sharp dip follows, and then an increase in activity continues following the holiday. Posts from this time of year run the gamut. Some posts are proud and upbeat proclamations of milestones or simply just well wishes for a happy (and sober) Christmas. Some talk about struggles in staying sober during the holiday season. Some are guilty admissions of falling off the wagon. In fact, next to Father’s Day, Christmas was the holiday that had the most posts in which people announced a relapse. The subreddit r/StopDrinking is an excellent place to turn to for support when you need it most. Unlike meetings, this is not only a place where alcoholics can turn to discuss their issues with total strangers in a truly anonymous fashion, but it’s also a place where people can get almost instantaneous support at any hour. But when you need to get real, face-to-face help with an alcohol problem, you can’t turn to an online support community. You need live assistance and personalized recovery solutions. That’s where Recovery.org comes in. Our treatment support specialists are here to help you assemble the best plan for you or your loved ones who struggle with alcoholism or any other addiction. After going through any of our recovery programs, support communities, such as r/StopDrinking, are wonderful tools to help you maintain a sober, healthy lifestyle. If you think you or a loved one needs help, call 1-888-319-2606 Who Answers? today. 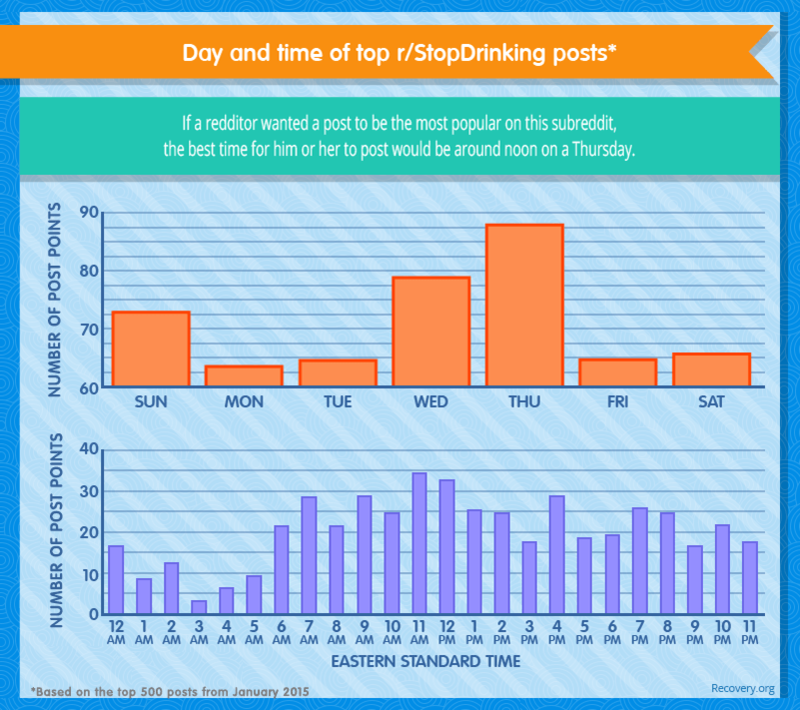 We analyzed Reddit’s “StopDrinking” subreddit to analyze interactions and gather data on the community. All of the assets found on this page were created using Reddit’s API and other Reddit analysis tools found in the sources section below. 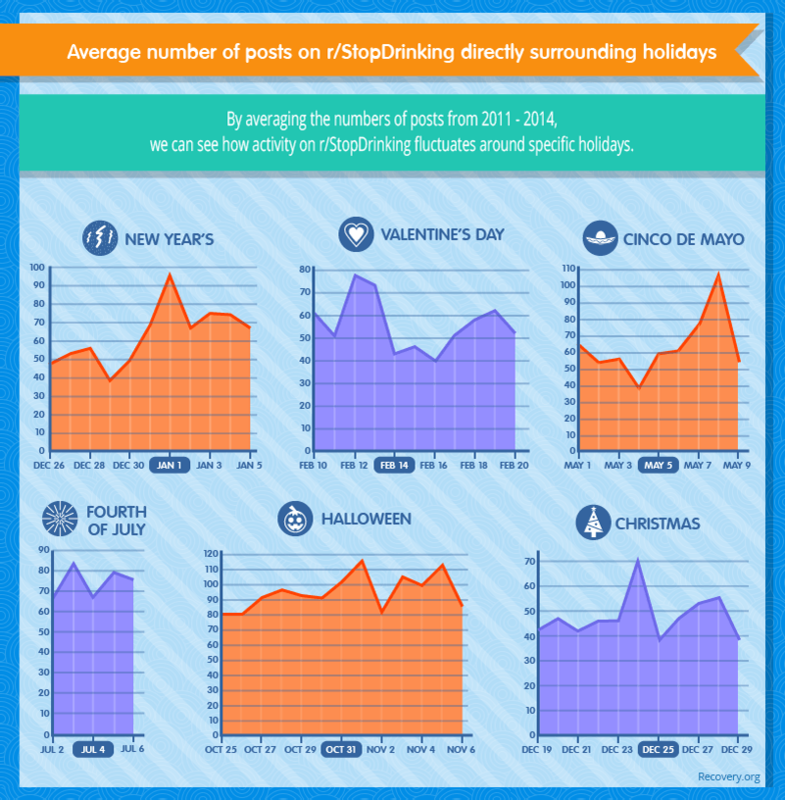 To give readers a more accurate glance into when r/StopDrinking users are sharing around each holiday, the number of posts made from 2011-2014 were averaged together.